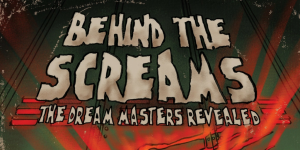 Mick Strawn, production designer for A Nightmare on Elm Street 4: The Dream Master and A Nightmare on Elm Street 3: Dream Warriors has launched the kickstarter for his book Behind the Screams: The Dream Masters Revealed. The book will tell the story of the making of Dream Master, with exclusive interviews from Robert Englund, Lisa Wilcox, Rachel Talalay, Bob Shaye, Renny Harlin and more. 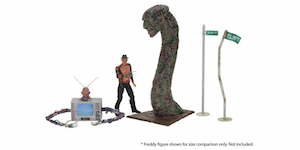 NECA’s ‘Dream Warriors’ Accessory Pack Includes “Freddy TV” and Massive “Freddy Snake”! NECA is releasing an A Nightmare on Elm Street 3: Dream Warriors accessory pack coming later this year. 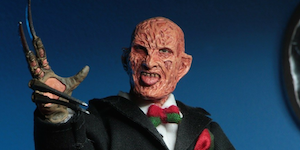 “I said, where’s the f**king bourbon?” We love tuxedo Freddy from A Nightmare on Elm Street 3: Dream Warriors as much as the next Nightmare fan, and now you can own him! NECA has released more photos of its upcoming tuxedo Freddy, both the figure and the box which includes artwork by Nathan Thomas Milliner. Runner Races as Freddy Krueger in Nightmare Mission! 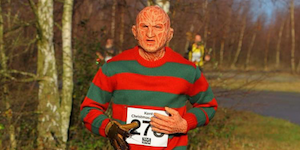 Runner Peter Redwood-Smith was Krueger for a cause. Redwood-Smith challenged himself to run 52 races in 52 weeks to raise awareness and funding for various causes. We give him kudos not only for the great things he’s doing, but also for running in a mask and sweater. 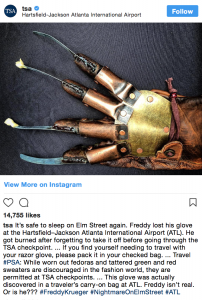 If you wonder why Freddy rode a broom in Freddy’s Dead, it’s most likely because TSA wouldn’t allow his glove onboard. TSA apprehended a replica glove that someone tried to take a glove through security in Georgia. While they didn’t get to keep their glove, we hope they at least appreciate the humorous Instagram caption.